Apex Legends’ first season, Wild Frontier, is here, bringing a battle pass, a new character, and some other changes. This is the biggest update since the game launched in February. After spending a few hours playing as new Legend Octane, I’m excited for this new influx of content, even if I’m not entirely sure what it will bring. The new Legend, Octane, costs 750 Apex coins (about $7.50) or 12,000 free Legend tokens to unlock, the same as existing characters Caustic and Mirage. Octane has a daredevil backstory, and his abilities are appropriately all about movement. He looks a bit like a Borderlands character, with his midriff-baring shirt and goggles, and he also has bionic legs. His tactical ability lets him trade a bit of health for a six second speed boost, an ability that’s aided by his passive, which lets him regenerate health over time when out of combat. Planned correctly, you can use his speed boost pretty much with impunity, since you’ll regenerate the health it costs as long as you stay away from gunfire. I found it useful for zipping around hot drops to scoop up loot before anyone else and to catch up with my teammates if we got too far apart. Once, in combat, it helped me make a speedy getaway around a corner to recharge my shields. I didn’t find the passive health regeneration terribly helpful otherwise, but I don’t tend to escape combat once I’m in it. I could see Octane’s passive ability making him very hard to kill in the hands of a player skilled in thoughtfully engaging and disengaging from gunfights, especially with teammates who keep the pressure on the enemy while Octane heals. Octane’s ultimate drops a jump pad that he and other players can use. The range isn’t overwhelming; it’s not nearly as much of a useful traversal tool as Pathfinder’s zipline or Wraith’s portal. Like Octane’s tactical, the jump pad is most useful for repositioning in a fight. During my playtime I didn’t get many opportunities to really use it in combat besides one ill-advised dive-bomb into a skirmish to try to rescue a teammate (I failed), but I can see players who are savvy with their spatial awareness using the ability to great effect. Octane could function similar to Wraith in a fight, with his fast movement and repositioning ability making him hard to pin down. 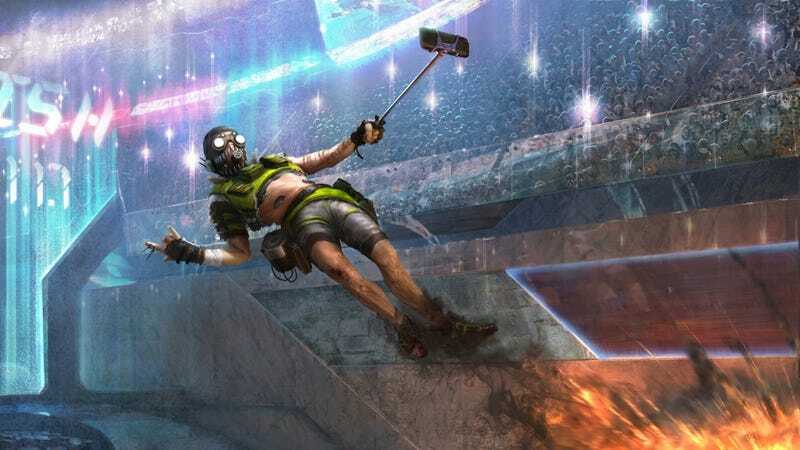 Apex Legends’ first battle pass dropped alongside Octane. At roughly $10, it’s comparable to Fortnite’s in terms of pricing; for 2800 Apex coins players can unlock the first 25 levels of the 100-level pass, a system Fortnite also has. Some players have been disappointed with the rewards available in the pass, feeling there are too many character- or season-specific badges and not enough new skins and cosmetics. Yesterday, developer Respawn wrote that “Our first Battle Pass is all about letting you continue to learn and experiment with the core Apex Legends experience while earning awesome loot at the same time. You’ll notice the first version isn’t built around a complex quest system” a la Fortnite’s challenges. Respawn writes that they plan to experiment more with the pass in the future. While Apex stands out from the battle royale crowd for its movement and communication, its cosmetics and customization options aren’t as exciting as games like Fortnite or Overwatch. This first battle pass feels underwhelming to me the way that all of the game’s customization options do—for me, there just aren’t any must-have weapon skins or banner poses. Nevertheless, I’m excited to have more options to level up, which feels good, even if it doesn’t earn me in-game items that I want. Along with the battle pass and new character, Respawn has made some fixes and adjustments. Most notable is the much needed in-game report feature for consoles and PC, especially as the game struggles with cheaters. The patch notes also read that Respawn has “adjusted hitboxes for Gibraltar, Caustic, and Pathfinder to better align with their shapes,” another much-wanted feature, as players were frustrated by larger characters having larger hitboxes. The patch notes make mention of fixes for crashes on PC, which have plagued many of the friends I play with. While playing today I had several instances of lag or the dreaded slow motion bug, but hopefully performance will settle down and improve as the season goes on. It can be easy to forget that Apex Legends is still a fairly new game, given its popularity and polish. This battle pass and new character are first steps in an evolving game, coming after players have had enough time to get their bearings and start wanting something new. How Octane, as well as the battle pass, will change the game and players’ opinions and playstyles remains to be seen.